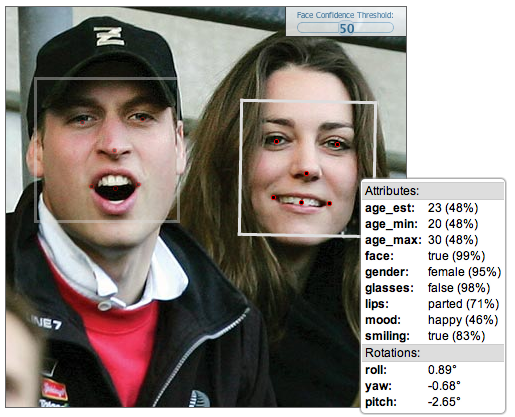 Facial-recognition platform Face.com could foil the plans of all those under-age kids looking to score some booze. Fake IDs might not fool anyone for much longer, because Face.com claims its new application programming interface (API) can be used to detect a person’s age by scanning a photo. With its facial recognition system, Face.com has built two Facebook apps that can scan photos and tag them for you. The company also offers an API for developers to use its facial recognition technology in the apps they build. Its latest update to the API can scan a photo and supposedly determine a person’s minimum age, maximum age, and estimated age. It might not be spot-on accurate, but it could get close enough to determine your age group. The algorithms also take wrinkles, facial smoothness, and other telling age signs into account to place each scanned face into a general age group. The accuracy, Hirsch told me, is determined by how old a person looks, not necessarily how old they actually are. The API also provides a confidence level on how well it could determine the age, based on image quality and how the person looks in photo, i.e. if they are turned to one side or are making a strange face. “Adults are much harder to figure out [their age], especially celebrities. On average, humans are much better at detecting ages than machines,” said Hirsch. The hope is to build the technology into apps that restrict or tailor content based on age. For example the API could be built into a Netflix app, scan a child’s face when they open the app, determine they’re too young to watch The Hangover, and block it. Or — and this is where the tech could get futuristic and creepy — a display with a camera could scan someone’s face when they walk into a store and deliver ads based on their age. In addition to the age-detection feature, Face.com says it has updated its API with 30 percent better facial recognition accuracy and new recognition algorithms. The updates were announced Thursday and the API is available for any developer to use. One developer has already used the API to build app called Age Meter, which is available in the Apple App Store. On its iTunes page, the entertainment-purposes-only app shows pictures of Justin Bieber and Barack Obama with approximate ages above their photos. Other companies in this space include Cognitec, with its FaceVACS software development kit, and Bayometric, which offers FaceIt Face Recognition. Google has also developed facial-recognition technology for Android 4.0 and Apple applied for a facial recognition patent last year. The technology behind scanning someone’s picture, or even their face, to figure out their age still needs to be developed for complete accuracy. But, the day when bouncers and liquor store cashiers can use an app to scan a fake ID’s holder’s face, determine that they are younger than the legal drinking age, and refuse to sell them wine coolers may not be too far off.